Mercedes-Benz is synonymous with luxury and quality. This is true of their commercial vehicles as well as cars. 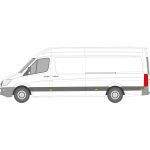 We supply Mercedes van glass for a number of their panel and crew vans. 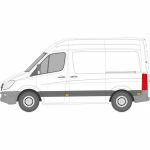 Run a business that fits Mercedes van windows? 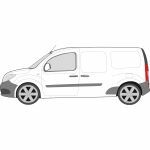 Whether you need windows for a van conversion or a replacement, Van Glass will help. We supply high-quality aftermarket vehicle glass for a number of Mercedes models. Look below to see which ones we supply. Need some help to make sure you get the right glass? Get in touch via our contact form or call us on 01228 810 018 and we’ll be happy to help. 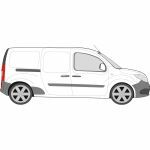 Need your Mercedes van glass in a rush? Whether you’ve got a customer in dire need of a replacement or itching to get a start on their conversion, we’ll get it to you as soon as possible. Order before 17.30pm Monday - Thursday and you’ll get your van glass the very next day (UK mainland only). Need the glass fitted too? 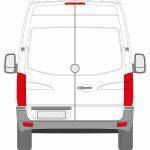 Van Glass only supplies the glass, so if you need fitting you’re not quite in the right place. However, our parent company tradewindscreens.co.uk based in Carlisle, does fit windows. Have a look at their website for more information. Can’t find the right Mercedes van glass? Or want some fitting advice? Get in touch via our contact form or call us on 01228 810 018 and we’ll be happy to help you get sorted.